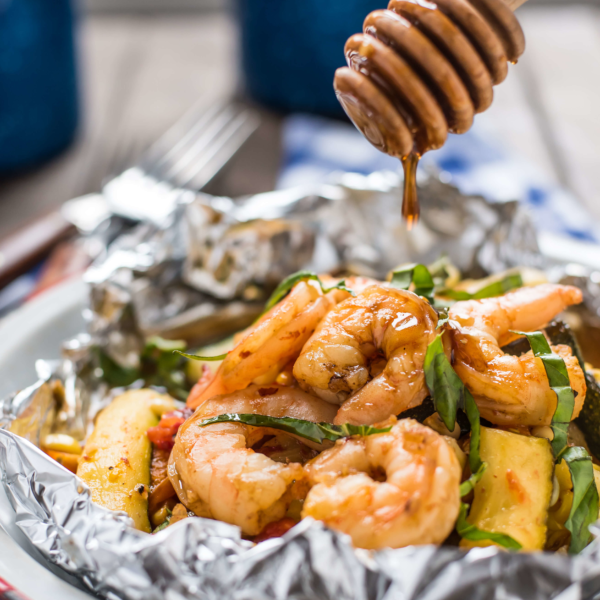 Whether cooking over an open fire or on your backyard grill, these Honey Garlic Shrimp Foil Packets are the perfect summer dish! Preheat a gas grill to 400F or medium high heat. Place two pieces of foil in an X shape. Repeat so you have four total packets. In a small bowl, whisk together the honey, garlic, vinegar, tamari, olive oil and red pepper flakes. Season to taste with salt and pepper. Place about 1/2 cup of the rice in the center of each X. Divide the zucchini, corn and tomatoes evenly between the packets. Top with the shrimp. Sprinkle everything with salt and pepper. Drizzle the honey glaze evenly over the packets, reserving 1/4 cup for serving. Bring the edges of the foil up over the vegetables and shrimp and fold over to create a seal. Prick with a fork a few times to allow steam to escape. Place the foil packets on the grill and cook for 12-15 minutes or until shrimp is pink and vegetables are tender. Serve the packets straight from the foil or in bowls, drizzled with additional glaze and fresh basil.